Def Leppard and KISS 2014 Heroes Tour will start on 23rd June and run until 31st August according to Yahoo news. The press conference announcing the dates is taking place soon at the House Of Blues in Los Angeles. Watch at Live Nation's website at 6pm (UK) on Monday 17th. Yahoo News and other outlets have run a story with some details of the tour already. It will start in West Valley City/Salt Lake City, UT on 23rd June and end on 31st August in Houston, TX. 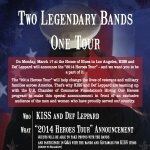 Kiss and Def Leppard are joining forces for a summer tour. Def Leppard's Joe Elliott said it's not likely the two bands will perform together. "We're not jam bands either of us," Elliott said in an interview from Dublin. "It's very theatrical what Kiss does to a lesser extent obviously 'cause we don't do the makeup thing, our show runs like a military operation for sure. It's not like the Grateful Dead and Phish touring or something."